Soon enough, it won’t be like this. This was Sunday at the USTA Billie Jean King National Tennis Center. On the day before the tournament got underway, there was a certain languid quality in the air. Groundskeepers, TV crews, technicians, merchandise vendors, food makers, tournament staff members and more organized themselves for the next day’s crush of masses who come Monday morning will flock to the tournament’s 17 courts (and 566 public toilets). Meanwhile, spread across the venue’s 42 acres, players practiced. You will walk into the exam room, a professor once said, and then you will clarify conclusively all that you have learned. This Sunday prior is no longer the time to build skills. This is the time to sharpen them just enough to be proficient, but not too much so that they dull. At 10:00 a.m. Sunday morning on Court 6, CiCi Bellis reached into her racquet bag, pulled out her frame and began a practice session. Back at the 2014 US Open, Bellis was the 15-year-old from California who upset 12th-seeded Dominika Cibulkova. “What do you think of CiCi’s chances to win Slams?” I was asked just after that at an event that took place a short drive from Bellis’ home in Atherton, California (south of San Francisco). My answer: Given that Bellis finished ’14 ranked #257, I don’t even want to think right now about that question. But three years later, she has entered the early stages of a ripening phase. Ranked 90 at the end of ’16, Bellis, now based at the USTA National Campus in Orlando, reached a career high ranking of #35 on August 14. She has earned several impressive wins, including two-time Wimbledon champion Petra Kvitova, longstanding top tenner and another double Slam winner, Svetlana Kuznetsova. So Bellis, battles will be one by her mastery of the intangibles. Certainly, Bellis has fine ball-striking skills, most notably this year having added more shape and spin to her forehand. Invariably, coaches will say how she needs to move forward (has a coach ever suggested retreat?). And her second serve is hardly imposing. But watch Bellis’ energy. Her eyes and feet are perpetually immersed. Tuesday she’ll start it off versus 80th-ranked Nao Hibino, a player Bellis has beaten both times they’ve played. Meanwhile, way at the east end of the venue, inside the temporary Louis Armstrong Stadium, a man 14 years older and 16 inches taller than Bellis went about his business. There was John Isner, throwing down one serve after another, a cascade of sheer velocity – not just a dart ala Roger Federer, but a full-bodied lightning bolt. It’s now been a decade since Isner made his US Open debut. Back then he was the carefree young man fresh off the University of Georgia campus, in certain ways an accidental tourist to the tour who over the course of an amazing summer became a bona fide pro. Since then, Isner has won 12 titles (including two this summer), become the top-ranked American – but only once reached the quarterfinals at his homeland Slam. In one of those bizarre twists that is a tennis application of a Franz Kafka tale, three years in a row (’12-’14), Isner was eliminated by a tidy man with a slick backhand, Philipp Kohlschreiber. But all that meant nothing. Isner too has his urgency, the tall man’s confidence in the tangible: his big weapon of a serve, supported by the powerful forehand and sprinkles of touch at the net. 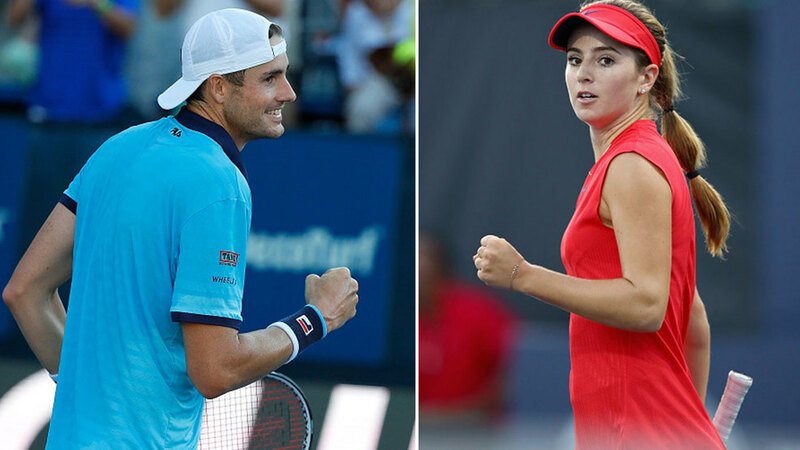 Bellis and Isner – at opposite stages of their careers, at opposite stages of style, but similar now on the eve of the year’s final major. Ready and urgent.